Few would disagree that the Neumann U87 is both instantly recognisable and one of the most highly revered and respected microphones in the world. It has long been considered one of the very best studio all-rounder mics, guaranteed to deliver a very usable sound under pretty much all circumstances. However, there have been at least two different versions of the U87: the original U87 model was launched in 1967, and was replaced by the current U87A model in 1986 (see box). In most respects, the new model brought significant technical improvements, although seasoned Neumann aficionados often like to debate the sonic differences! What does all this have to do with the American boutique microphone manufacturers Peluso? Well, John Peluso has been servicing and repairing classic vintage mics — including the U87 — for over 35 years, and has used that knowledge and experience to develop his own ever-growing range of capacitor (both solid-state and valve) and ribbon mics. These mics are built using carefully selected components — like power supplies, metalwork and capsules — sourced from around the world, but are all hand-crafted in America (in Floyd County, Virginia), and the end results are definitely more than the sum of the individual parts. I’ve reviewed several Peluso mics already, and most are ‘styled after’ obvious vintage classics. For example, the Peluso 22 251 is based on the Telefunken ELA M251, the 2247SE on the Neumann U47, and the P-67 on the Neumann U67. These reviews can be found in the May 2010, September 2007 and August 2012 issues, respectively. 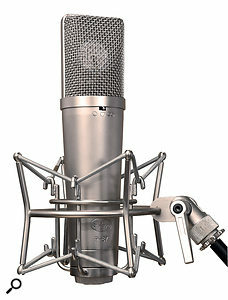 The last mic in that list is relevant here, since the Neumann U87 was designed as the solid-state replacement for the U67, and the latest addition to Peluso’s range is the P-87, which, as the name makes abundantly clear, is styled after the original Neumann U87, which was ubiquitous in professional recording studios around the world throughout the mid-1970s. Shipped in a smart, locking flightcase, the mic itself arrives in a sealed plastic bag complete with a desiccant packet. However, a nice velvet bag is included for daily storage, along with a foam windshield, a fixed stand-mount bracket and a traditional cat’s-cradle shockmount (complete with a couple of spare elastic loops). The mic attaches to the bracket or cradle via a threaded column extending from the base of the mic, with the output XLR connector located inside the column in the traditional way. Apparently, matched pairs of P-87s are available upon special request. Naturally, the electronics are all solid-state, and include a FET impedance converter and a custom output transformer.The mic itself is a similar size and shape to Neumann’s U87, and the anodised brass body and multi-layer mesh grille are virtually identical to those used in the P-67 model — although the P-87 is slightly shorter than its sibling. 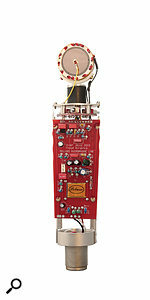 The company logo and model number are stamped on the body to identify the front of this side-address mic, and three heavy-duty miniature toggle switches protrude just below the grille. The one at the front selects omni, cardioid or figure-of-8 polar pattern, while the two at the rear introduce a 10dB pad (to allow close working with loud sources), and/or an unspecified high-pass filter. The manual states that this filter is designed to counteract the proximity effect when used very close to a source, so I would expect a 6dB/octave slope starting relatively high up at 150 or 200 Hz. Internally, the dual-diaphragm capsule employs 34mm, gold-sputtered, centre-terminated diaphragms front and back, with FET-based impedance-conversion circuitry and a custom output transformer. 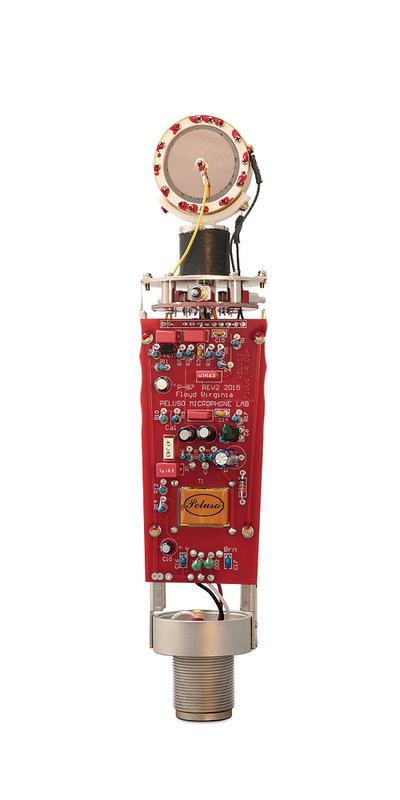 The capsule biasing and impedance converter electronics run from a standard 48V (±4V) phantom supply, but although the Peluso draws considerably more current than the Neumann original, it’s still a relatively benign load at 4mA. Sensitivity is given as a moderate 10mV/Pa — which is very similar to the original U87 design but about 6-9 dB quieter than a modern Neumann U87Ai. Maximum SPL capability is given as 152dB, which is significantly higher than either of the Neumann variations, while the equivalent self-noise is given as 14dB A-weighted, which is on a par with the modern U87Ai and a good 3dB quieter than the original U87. Mechanically, the mic measures 56 x 228mm, and it weighs 584g — making it 28mm longer and 84g heavier than the original U87. The internal construction is very neat and uses high-quality components and glass-fibre circuit boards, and the mic feels well-built and robust. The shape and overall design of Peluso’s P-87 is very obviously reminiscent of the Neumann classic, but not to the extent that it would mislead anyone. However, it still looks classy and expensive, and it has a physical visual presence that impresses. The mic mounts easily into its cat’s-cradle shockmount, which appears to provide a good level of isolation from low-frequency external mechanical vibrations. The mode switches are easy to access and use — easier than the fiddly slide-switches of the Neumann design, actually! 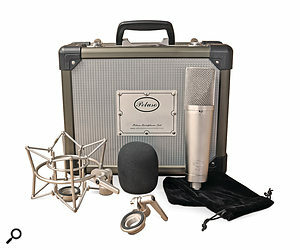 The P-87 ships in a hard carry case, and comes with a shockmount, wind shield and protective pouch.Unlike valve mics, the solid-state electronics of the P-87 allow the mic to function within a few seconds of receiving phantom power, although I found the sound mellowed slightly after a minute or two. The sound character has a full low end, especially if used close to a source, with a clear and detailed mid range. It sounds cleaner and more neutral than the P-67, but it still has an involving and well-focused sound which is quite U87-like. However, to my ears the high-frequency performance is not quite the same, and I’d say the top end sounds generally slightly more pronounced than that of an original U87. Whereas the Neumann U87 has a well-controlled but defined HF peak around 9kHz, the P-87 gives the impression of a much wider general HF lift that starts from about 1.5kHz and tails off gently above about 10kHz, reaching maybe a 3dB lift from 2.5kHz upwards. In other words, it sounds a little brighter overall, but slightly smoother and less peaky — and this is similar to a characteristic I noticed in Peluso’s P-67 mic as well. On the original U87, the HF peak moves audibly down to a slightly lower frequency (from maybe 8kHz to about 5kHz) when switching to the fig-8 pattern from either of the other polar responses, but I didn’t notice a similar reaction with the Peluso. One of the notable strengths of the Neumann U87 is that it tends to help vocals and solo instruments cut easily through a mix without needing a lot of creative EQ work, but I’m not convinced that the wider HF lift of the P-87 is quite as effective in that respect. I also found that it tended to bring out vocalist sibilance a little more than I would expect of a Neumann U87. There’s no doubting that the Peluso P-87 is a very high-quality microphone, and it has a large and well-balanced sound with an authority and presence that works well on a wide range of sources. Its current price makes it roughly half the cost of a Neumann U87, yet it delivers probably 90 percent of the sound character and quality. For many, that would be more than enough, and the P-87 would be considered something of a bargain microphone... However, at the end of the day it isn’t a real Neumann U87, and for many having the purple diamond on the front of the microphone is as important — if not more so — as the classic sound character. It’s a statement of standing and intent in the studio which the Peluso, for all its extremely admirable qualities, can never match. A lot of companies offer microphones which are claimed as U87 equivalents, or mics which have been inspired by the U87 — and all with varying degrees of success. Of course, some pay rather more attention to the mechanical styling than the sound character, too. Companies with products worthy of consideration include ADK Custom Shop, BeesNees, Blue, Bock/Soundelux, Brauner, JJ Audio, Lauten, Miktek, Microtech Gefell, and Neumann themselves, as well as Peluso. However, the Neumann U87 is such an iconic microphone that, while others may perform as well (or better), none can match the cachet of the original. The original U87 was introduced in 1967, as the direct successor to the U67 which appeared just seven years earlier. 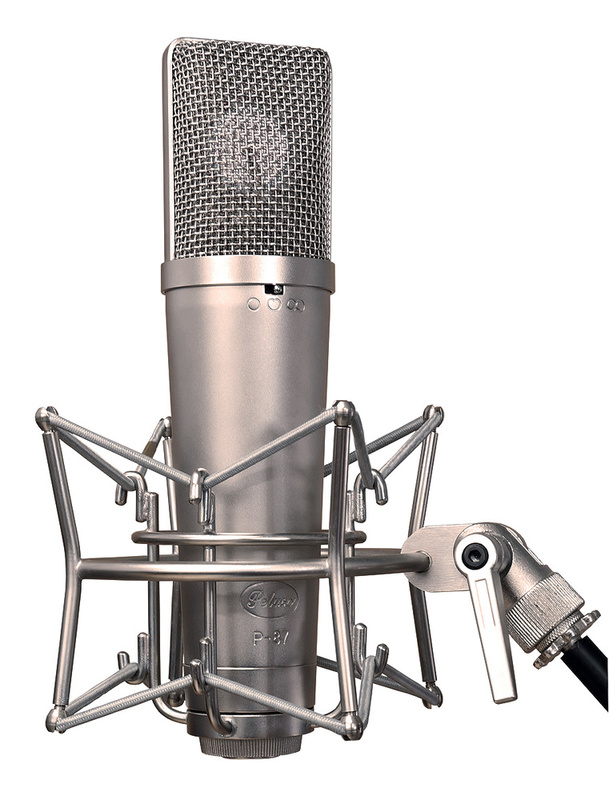 Launched in Neumann’s first ‘FET 80’ series of mics, which were the first to use solid-state FET electronics, the U87 was presented alongside other now-revered classics such as the KM86, KM84 and KM83. Neumann were very proud of their first range of ‘transistor condenser microphones’, and made a big thing of the far more robust technology that didn’t require separate power units and heavy, stiff multi-core cables for each microphone, and allowed for the mics to be made much smaller. Internally, however, the company were relieved that the production process no longer involved the tedious testing of valves to find examples which were up to spec and not microphonic. Apparently, Neumann had a deal with their valve suppliers Telefunken that they would return valves which didn’t come up to their specs. In the early days the rejection rate was very low, but towards the end of the ‘60s it had started to become alarmingly high. Neumann suspected that Telefunken weren’t always sending them brand-new valves, and started discreetly marking the valves they were rejecting... and then found that these same valves were being sent back to them as new units three months later! And that was when they decided to cease production of all of their valve mics and move into solid-state designs completely. Available with either XLR or DIN socket connections, Neumann’s U87 model was designed to run either on the newly introduced standard of a 48V phantom power supply — a Neumann invention, by the way — or two internal 22.5V batteries (Everready No. 505s, in fact, which were popular in camera flash guns!). However, although Neumann’s elegant P48 system was quickly adopted around the world, it was in direct competition with a popular alternative mic-powering scheme known as ‘AB’ or ‘Tonader’ powering, which applied a 12V DC supply between the two signal wires. So to ensure the company could still sell their latest transistor microphones into the Tonader marketplace, Neumann created a sibling to the U87 the following year, called the U77 (manufactured between 1968 and 1974), which operated either on AB power, or an internal 9V battery. Whereas the U87 has always used an output transformer, the U77 was transformerless; and it is both interesting and significant to note that the U77 had to employ an internal DC-DC converter to step the 12V supply voltage up to provide the traditional 60V capsule bias. The U87 lacked this DC-DC converter, and instead employed the 48V phantom power directly to bias the capsule. This difference meant that the U77’s self-noise measured about 3dB less than that of the U87. However, with no DC-DC converter and only a fixed +48V bias voltage available, the U87 had to create the fig-8 polar pattern by inverting the signal polarity of the rear capsule in the impedance-converter circuitry, and that necessitated isolating the two centre electrodes from each other — hence a slightly different capsule design. Thankfully, 22.5V batteries eventually became obsolete and Neumann were able to revise the U87 in 1986, replacing the battery compartment with an internal DC-DC converter, rechristening it the U87A (the ‘i’ suffix in the common contemporary U87Ai denotes an XLR output connector). With a DC-DC converter on-board, the mic could at last revert to the original K67 capsule (now renumbered as the K870/67 capsule), and the restored 60V bias voltages improved the self-noise performance by 3dB to match its antecedent once again. There were a few other specification changes too, not least being a doubling of the phantom-power current requirement from a measly 0.4mA in the original model to a still very dainty 0.8mA. With the revised powering arrangements, the polarity inversion circuitry was no longer required and the entire impedance converter was updated to improve the specifications. The microphone’s sensitivity was increased from between 5-8 mV/Pa to a much more substantial 20-28 mV/Pa (the actual sensitivity varied slightly with polar pattern), and the maximum SPL capability fell slightly from 132 to 127 dB. With the changes in capsule and electronics between the original U87 and U87A models, it’s not surprising that there are slightly variations in the on-axis frequency response, although the fundamental character is extremely similar. The characteristic HF peak centred around 9-11 kHz (most obvious in the omni and cardioid modes) is present in both mics, although the later A model exhibits around 1dB more HF lift and is often perceived as being fractionally brighter. The polar responses are virtually indistinguishable between the two models, with the usual narrowing at extreme HF and opening out at LF. Sound quality well tailored to resemble the overall U87 character. Very good value indeed at its introductory price. Mechanical styling reflects the Neumann inspiration without being slavish. Excellent build quality and a good set of accessories. The HF response has a noticeably different character to the original — not bad, just different. Styled to resemble its namesake, both in shape and sound, the Peluso P-87 is intended as an homage to the original 1970s Neumann U87, but benefits from modern performance specifications and a much higher SPL-handling capability.